The connection of the Haftorah to the Parsha: Parshat Tzav deals with laws pertaining to Korbanot, Animal Sacrifices. This Haftorah discusses the opposite. We hear how Hashem will not accept sacrifices in place of obeying His will. The storyline of this week’s Haftorah: The Haftorah discusses how Hashem will not accept the sacrifices from the Jews who do not obey him. Hashem is also angered because Jeremiah had repeatedly warned the Jewish people to stop their collective self-deception, only to be ignored. The Jewish people were “manipulating” Hashem regarding the purpose of the sacrifices. Not only didn’t make Hashem happy to hear the crackling of the fat from the burning animals, Hashem resented their insincerity. To add to that many Jews were involved in idol worship. Tophet, meaning “place of fire” was a site of worship for the Pagan god Molech. It was located in a valley on the southwest side of Jerusalem. It was also know as the Valley of Ben Hinnom. It was used as a garbage dump and therefore there was a continual fire burning there, which is how it became a euphemism for Hell. However it’s primitive root word “Toph” meant “playing or beating a percussion instrument such as a tumbrel, tambourine, or drum”. Scholars believe that it was possible that the percussion instruments were used to drown out the sounds of the infants as they were burned alive. 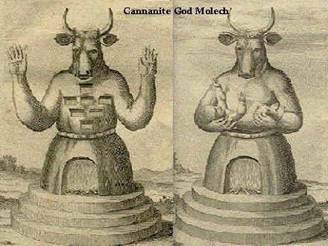 Molech had the head of a bull with two horns and the body of a man. The idol’s stomach was hollow and was the furnace for the fire used during the sacrifice. When hot enough, the infant was a placed into the arms of the idol. It is not known when the Israelites started sacrificing their children; however, Hashem clearly prohibits such forms of worship and indicated that sacrificing innocent children was murder (“blood on their hands”). The punishment for idol worshipers is also discussed, as well as what a Jews goal in life should be. The Haftorah begins with the Prophet Yirmiyahu. He “encourages” the Jews to increase their sacrifices, saying “Eat meat!”. This was meant to be ironic because he is accusing the people for their “outward” service to Hashem. The Jews are only preparing sacrifices so that they can eat the meat left over. Yirmiyahu then goes on to discuss how the original covenant with their fathers in Egypt involved only one sacrifice, the Pesach offering. There wasn’t any other discussion about other sacrifices, just that one. There was just the command to walk in the way of God. The bitterness continues as Yirmiyahu realizes that his words aren’t being listened to, even though the messages are being given in the name of God. He goes on to warn the Jewish people to go into mourning because of the sins committed in God’s own House, the Holy Temple. The Jews had built shrines to idols. Yirmiyahu says that the valley that they were doing their idol worshipping, the Valley of Ben-Hinnom, will now be known as the Valley of Slaughter. It is named so not only because it will be used for burial purposes, but also because the bodies of the deceased were left unburied and become food for the wild birds and beasts. Finally, Yirmiyahu tells the people that the former joy and song of the cities of Judah and Chutzos, the markets of Jerusalem, will come to an end. Yirmiyahu describes the bones of the dead spread out before the pagan gods they had worshiped. It will be the bones of the kings, officers, priests, and neviim, and even the ordinary inhabitants of Jerusalem. Their bones will be taken out of their graves, none of them being spared. They won’t be reburied and their bones will suffer that indignity. Was born to his father Chilkiya, also a prophet, in 460 B.C.E., about 2400 years ago on Tishah Be’av in Anatot, 2 miles north of Jerusalem, in the land of Binyamin. He was born circumcised, a sign of a spiritually elevated person. His prophecies took place before, during, and after the destruction of the Bait Hamikdash (Holy Temple). Nebuchadnezzar King of Babylon destroyed the Temple. He remained in Jerusalem after its destruction with Gedalyah ben Achikam, the man whom the fast of Gedalyah is named after. Shafan was his scribe. Shafan brought the scroll he found in the Bait Hamikdash to Jeremiah, which was originally written by Moses. It was open to the verse "Hashem will bring you and your elected King to a nation unknown to your fathers." That scared people into changing their ways. He fled to Egypt, Alexandria where it is believed that he died. Famous Phrases: Jeremiah 24:7, “V’natati lahem lev lada’at oti” “And I will instill in them a heart that will seek to acknowledge me”. Haftorahman’s lesson of the week: The holy books teach us that the ancient idols of wood and stone have transformed into modern times into the worship of money. When is money a form of idol worship? When we forget that money comes from God, and consider money as a power in its own right. To what extent do you believe in God, and to what extend do you put your faith in the “The Almighty Dollar”? Timeline: This story took place about 2400 years ago. A map to show people how to get to “Gay Hinnom” or The Valley of Hinnom.